A bunch of Lamy Safari & Hero 359 fountain pens – Can you tell the difference? Well, there as it turns out, there is a “fake” Safari – the Hero 359 fountain pen made by the Shanghai Hero Pen Company (Hero Pen). Hero Pen was founded in 1931 as the Huafu Pen Factory and was renamed in 1966 to its current name. The company has manufactured a number of relatively inexpensive brands of fountain pens including Hero, Wing Sung, and Xinhua, just to name a few. Like many Chinese companies, it has copied or cloned the design of Western fountain pens, e.g., the Hero 100 is similar to the Parker 51 and of course, the Hero 359 is clearly modelled after the Lamy Safari. Why would or how could a company profit by cloning another pen that costs approx. $25-30? Well, readers with a business background might recognize the source of Hero Pen’s competitive advantage as cost leadership, i.e., winning market share by appealing to cost-conscious or price-sensitive customers. Cost leadership is achieved by having the lowest prices in the target market segment, or at least the lowest price to value ratio (price compared to what customers receive). If a company is to be profitable, with a high return on investment while offering the lowest price, the company must be able to operate at a lower cost than its competitors. A manufacturer like Hero Pen must produce high volumes of output such that fixed costs are spread over a larger number of units, resulting in a lower unit cost. Mass production becomes both a strategy and an end in itself. Higher levels of output both require and result in high market share, and create an entry barrier to potential competitors, who may be unable to achieve the scale necessary to match the firms low costs and prices. According to the Shanghai Daily, the Lamy Safari is very popular in China but is too pricey for many local customers. Thus, acting like a good capitalist, Hero decided to produce the pen because it received many requests and saw the market demand. While Lamy is quite aware of the Hero 359, Hero is of the view that the exterior design patent right of Lamy’s Safari series are protected for only 10 years in China and has expired. So much for the business lecture, how does the Hero 359 compare to the Lamy Safari? First, the Hero comes in a reusable plastic case along with a converter and a package of cartridges. The Safari generally comes in a cardboard box with 1 cartridge – and the converter is extra, adding anywhere from $5-10! The 359 comes in 5 “Summer” colours – Black, Apple Green, Yellow, Royal Blue and Purple, as can be seen in the large picture at the top of this post. The two pens are basically the same size, length, and weight; however, the parts are not interchangeable between them, e.g., you can’t swap caps. There are a number of design differences – the Hero flower symbol replaces the familiar X at the top of the Safari cap, the clips on the 359s are all stainless steel vs. coloured clips on certain Safaris, and the 359 is almost entirely round but for one flat section while the Safari has two flat and two round sections. P.S. As as been pointed out in the Comments below from several readers, Hero now seems to be offering a similar roller ball pen and also a fountain pen and roller ball pen kit that consists of a fountain pen and a roller ball pen section that is interchangeable with the fountain pen section. This development is not terribly surprising. From a cosmetic perspective, the 359 roller ball has an ink window in its barrel, just like the fountain pen – the Safari fountain pen has an ink window but the roller ball does not. It has also been noted that international size cartridges do not fit the Hero 359; however, the 359 does appear to accept Parker and Aurora cartridges. On the other hand, the cartridges that come with the 359 do not work with Parker pens. Shanghai Hero Fountain Pen Factory Lishui Co., Ltd.
How ironic – Hero wants you to check the pen carefully to ensure that it is not a counterfeit!! Question – Every now and then I seem to get a little bit of paper stuck in one of my fountain pen nibs when I’m writing. I was wondering if anyone else has that happen and any suggestions for cleaning it off. How hard do you press on the nib – if it happens on all different types of paper, try lightening up your pressure, let the nib glide along the surface of the paper. Check the nib – if the nib is aligned well and smooth, the paper fibers should not get stuck. So check the nib alignment first – is the slit off-center? Then with a loupe, check for rough spots, craters, or sharp points on the tipping – it should be smooth and shiny all around – and then check to see whether the inside of the tines have a sharp edge (if so, they may need to be smoothed – don’t try this yourself unless you know what you are doing!). If your pressure and nib are fine, you should check the nature and quality of paper that you use – crappy or cheap paper will fiber up and also the coating on “coated” paper specifically for use with Ink jet printers will eventually begin to “clog” the nib. It could also be your writing style – some nibs will simply not tolerate significant variations from “standard” writing angles. 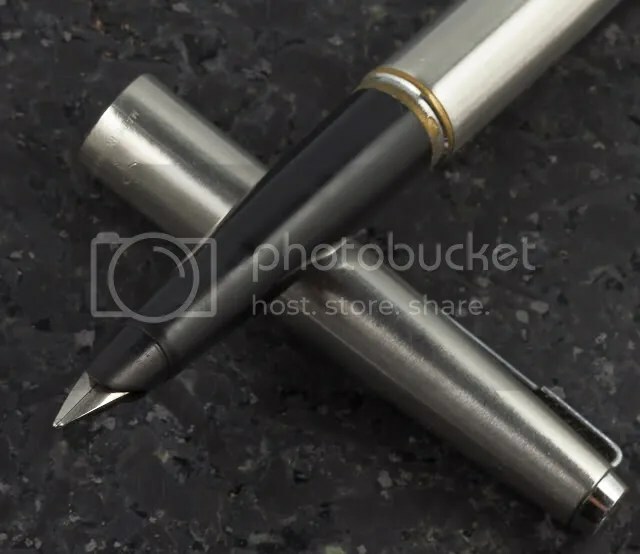 If you have a writing style other than the typical right handed 50 degree angle, the nib may never work for you properly and needs to be swapped. You could use a number of items – a piece of brass shim stock (0.002″ thick, available in hardware stores, Lee Valley, etc…), a piece of overhead transparency, a piece of film – all nicely washed in detergent – to floss the nib. 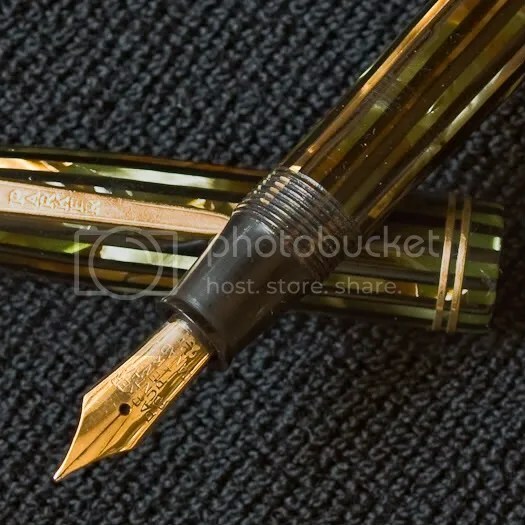 Question – Do you have any suggestions on how to remove a jewel from a Parker cap (Vacumatic and Parker 51)? I have a few that have loose clips and find it very hard to remove the jewel to tighten the clip. What tools do you use? Answer – Well, I’ve heard of a few things to try but didn’t have any success on the “51” I had with a loose clip. I think someone had set the jewel with some sort of adhesive; I probably should have tried a little gentle heat before attacking the cap jewel. In the end, after recognizing my own shortcomings, I had John Culmer fix it up for me – he had to break the old jewel and replace it with another. Slide a piece of a drinking straw over the clip to keep it from scratching the cap as it turns. Try a soft pencil eraser. Put the eraser on your table or bench and press the cap jewel into the eraser and turn the cap. The idea is that the soft eraser grips the jewel and allows you to turn it out. Try some sticky tack/blu-tack used for hanging papers or posters to a wall. Put a piece of sticky tack/blu-tack into the freezer for a few minutes to firm it up and then press the cap jewel into the sticky tack/blu-tack and turn the cap.